New K-Series Replacement Screens Program covers general purpose, supported, sanitary, self-cleaning and perforated plate screens in 2 inches to 500 mesh (50 mm to 25 microns). MILLBURN, NJ — A new K-Series Replacement Screens Program for round vibratory screeners of any make and model allows users to increase screening accuracy and reliability while decreasing downtime and cost, according to Henry Alamzad, president. 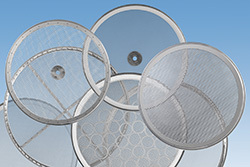 Five types of screens are offered in diameters from 18 to 100 in. (457 to 2540 mm): K-Dura screens for general purpose applications, K-Strong supported screens for high material loadings, K-Sani screens for 3-A, FDA, USDA and cGMP applications, K-Klean self-cleaning screens and K-Perf perforated plate "screens" for maximum durability. "In addition to providing exact screen replacements, Kason Customer Service Technicians can recommend variations that deliver greater throughput, durability or anti-blinding performance relative to existing or new materials being screened," says Alamzad. Offered weld-mounted or epoxy-mounted with or without center holes, the screens are available in meshes from 2 inches to 500 mesh (50 mm to 25 microns) in #304 stainless, #316 corrosion-resistant stainless, magnetic 430 stainless, exotic alloys and synthetics including Nylon, polyester and polypropylene, all in single- or double-mesh designs. The K-Series Program also introduces flexible purchasing options that can prevent downtime and reduce cost, including quantity discounts, blanket orders, just-in-time delivery, re-screening of existing rings and custom inventory management. A new on-line check-box quoting system provides users with rapid pricing and quick shipment information.